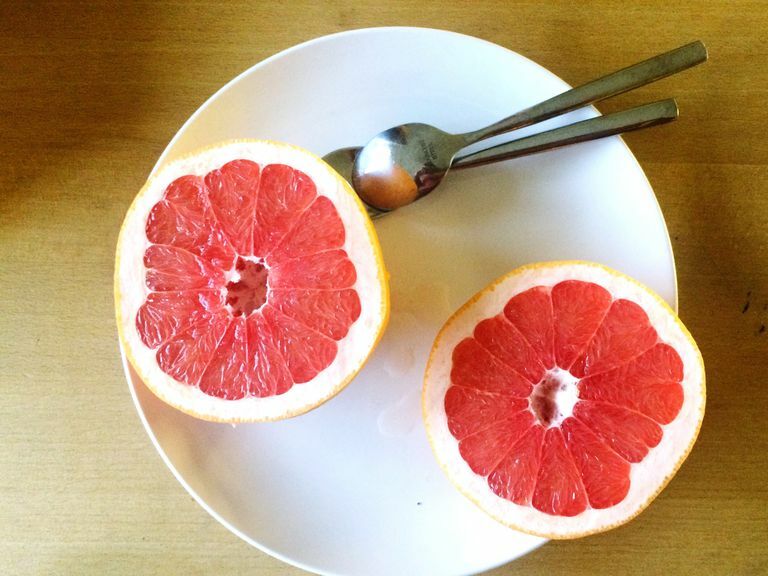 Will the Grapefruit Diet Help You Lose Weight? Remember the "grapefruit diet?" Well, grapefruits are once again a hot weight loss food. But are they really all they’re cracked up to be? Studies have shown that a compound called naringin in grapefruit could lower blood sugar and lead to weight loss. In one study, obese people who ate half a grapefruit before meals for 12 weeks lost significantly more weight than a non-grapefruit-eating control group. Another common claim about grapefruit is that it’s a "negative calorie" food, which means that you burn more calories chewing and digesting the fruit than you consume eating it. And when we burn more calories than we consume, we lose weight. Some researchers even claim that simply smelling the essential oil that comes from grapefruit can help curb cravings. What Does This Research Really Mean? There does seem to be some truth to the assertion that eating the big pink fruit before meals can help lower blood sugar and help burn away a few pounds. But it’s definitely not a miracle food. Eating any fruit before a meal could help with weight loss because it takes the edge off your hunger and could curb the amount of calories you consume. Be careful about the "negative-calorie" claim. Yes, grapefruit contains a reasonably small number of calories, but it’s not like celery in which you'd need to chomp your way through four 12-inch stalks before taking in 40 calories. Just half of a medium grapefruit has around 40 calories. So unless you're doing jumping jacks while you peel, eat, and digest it, it's unlikely you're burning more than you're consuming. As for grapefruit sniffing, don't put too much stock into it just yet. It's based on one study done on mice. An 80-calorie grapefruit has nearly three grams of naturally occurring fiber, lending to its low-calorie and filling appeal. A low-calorie snack benefits your diet for obvious reasons, and a filling one will leave you less likely to keep on eating. It's much pretty impossible to go overboard with grapefruit. Between the tart taste and the time and effort it takes to peel them, you can't mindlessly munch your way through several hundred calories worth of other snacks. Now bananas...that's another story. Grapefruit is such a unique and flavorful fruit. It's a fantastic way to bring tons of flavor to other healthy food. And when healthy food tastes great, you're less likely to turn to the bad-for-you stuff. In fruit salad. Grapefruit is a great addition to fruit salad because its tart taste balances out the flavor of the sweeter fruits. Try it with chopped Fuji apples, blueberries, and peaches. In salads. Throw a few wedges over chopped lettuce with chicken and squeeze some grapefruit juice over your salad for a delicious light dressing. Toss some avocado in there too. It's a great combo. As a lemon swap. Grapefruit wedges can be used just like lemon wedges. Serve chicken or fish with a few wedges, add them to water (still or sparkling), or give your iced tea a spritz. In cocktails. Mix a shot of vodka with no-calorie lemon-lime soda and a generous squeeze of grapefruit. Yummy! You can even muddle grapefruit with mint and stevia for an updated spin on a mojito. Just add rum and club soda. Solo. Cut it in half, sprinkle it with a bit of stevia (or your no-calorie sweetener of choice), and dig in. Remember: Studies have shown that consuming grapefruit with certain meds can have adverse health effects. If you’re on any medications, check with your doctor before adding grapefruit to your diet.